A kidney transplant is surgery in which a person who has permanent kidney failure receives a healthy kidney from another person. This single, healthy kidney takes on the workload of both of the person's failed kidneys. The failed kidneys usually are left in place. The new kidney is added to the abdomen. The new kidney can come from a living or dead donor. A living donor is often a close blood relative of the person who receives the new kidney (the recipient). However, in certain cases, a recipient's spouse or friend can be a kidney donor. 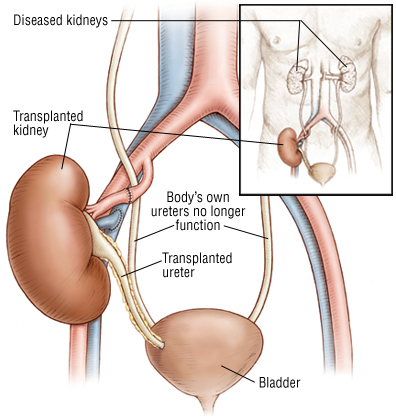 Most people are born with two kidneys, but really need only one of them: the second kidney is like an "insurance policy". Therefore, there is little risk in a living donor giving up one of his or her two kidneys.